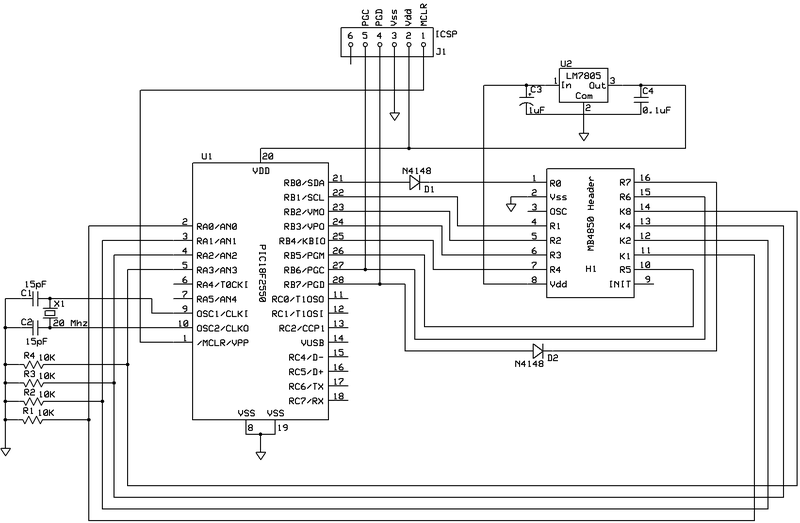 Simon18F is a project to replace the custom MB4850 processor of the MB Electronics Simon game with a PIC18F2550; initially to emulate the original Simon games and, later, to enhance the existing games and add new ones. The Simon18F processor board is based on the PIC18F2550 processor. I chose this PIC since it is a good combination of small-size and speed (48 Mhz). Since there is virtually no difference (in price) between the PIC16Fs and PIC18Fs the extra speed, memory and capabilities of the processor will enhance the abilities of this board greatly. As an alternative the PIC18F1320 could be used, however I’ve found the chip to be far to sensitive when run at 40 Mhz (it requires capacitors everywhere!). The board is a very basic PIC18F set up with a 5V regulator so the PIC can be powered by the existing 9V battery in the MB Simon game. An external 20Mhz crystal is also included which allows the PIC to run at the full 48Mhz. The extra speed is useful for PWM control of the LEDs and generating the sound for the game. 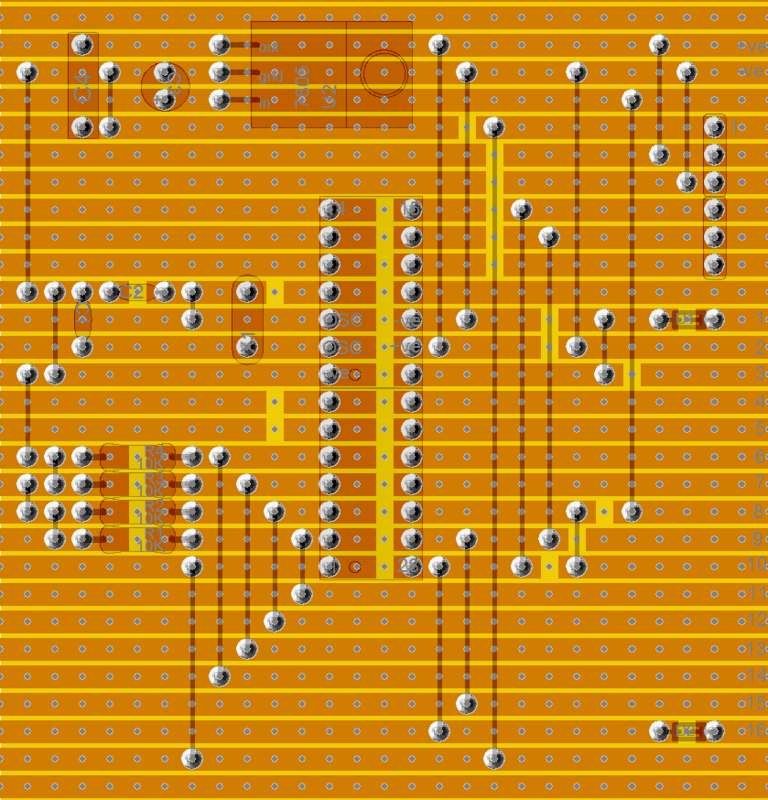 The input and output ports of the MB4850 processor are wired to the equivalent ports on the PIC. I decided to make the processor board on a small piece of strip-board which can fit under the mainboard inside the game’s case. 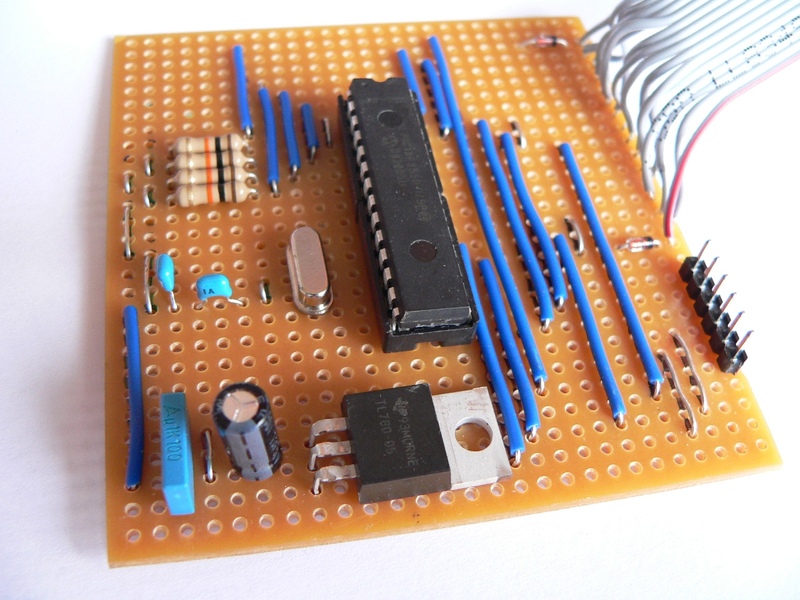 This makes it easy to make and also allows the board to be expanded if required (you could use the extra ports for an LCD screen, or as a serial/USB port to connect the game to a computer (I’ve deliberately left the required pins unused)). You may need to adjust the design a little if your component sizes vary from those shown. The header connector is connected to the processor board via a 16 way ribbon cable. The other end of the cable is soldered to a small piece of stripboard that has two single-row header pin strips soldered on which fit into the processor’s socket. Please see the video link above for details of how to fit the board into the game. 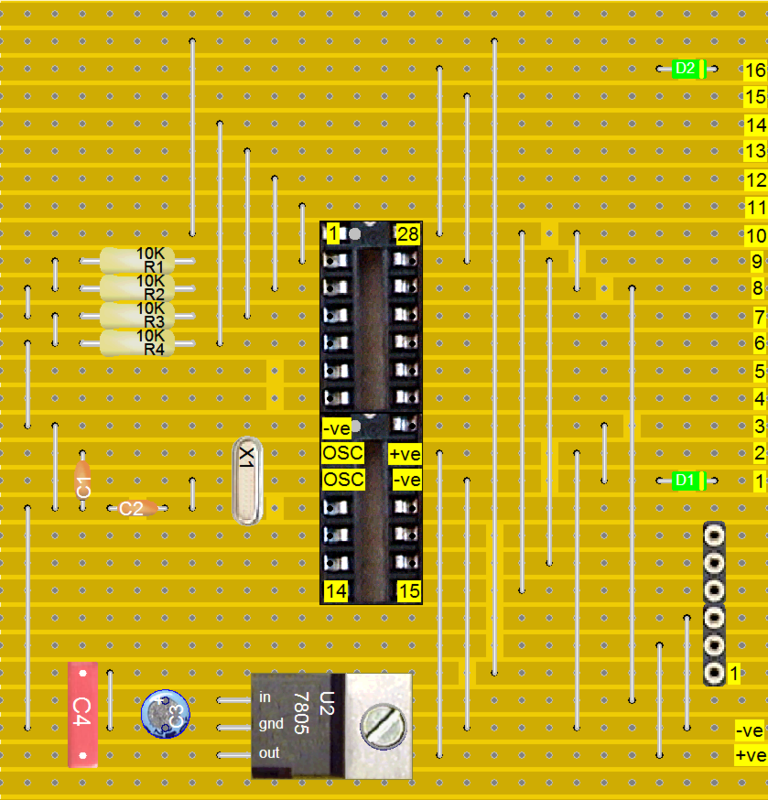 The software is based on the information from my previous project Reverse engineering an MB Electronic Simon game and attempts to follow the flow and timing of the original Simon as closely as possible. I also used my original Pocket Simon as a comparison to make sure the feel was right. 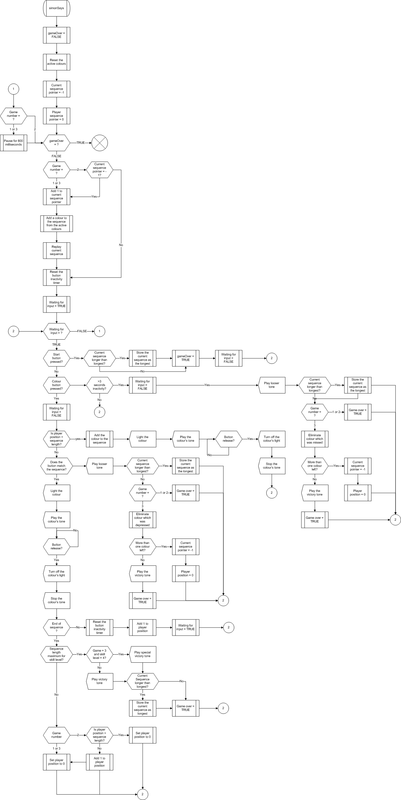 The software was designed using an SDL flowchart to ensure that the logic was correct (and efficiently written) before programming. The logic of the 3 games available on the Simon is shown in the flowchart to the right of the page. The code follows the flowchart using matching comments wherever possible; this makes it easy to trace and understand the C code. To make it as easy as possible to alter and adapt the Simon18F code I decided to use a high-priority interrupt to generate the sound and a low-priority interrupt to control the LED PWM dimming routines and the button scanning and debouncing. All communication between the hardware affecting interrupts and the game logic are perform through a C structure found in hardware.c. The software was compiled using Hi-Tech C Pro for the PIC18 MCU Family (Lite) V9.63PL2 which is freely available over the web.